The Fire Lake North project originates in the Fermont Iron Ore District (FIOD) in eastern Quebec. It is located at the northern limit of the Fire Lake Mine, operated by ArcelorMittal, and is 60 km south of the Bloom Lake Mine, a recent acquisition of Champion Iron. The iron deposits in this sector metamorphosed into coarser ores during orogeny of the geological Glenville province. Total resources of 3.4 billion tonnes, of which 1.2 billion (total in-pit) are outlined in the Fire Lake North east and west pits. The four mines currently in operation in the Fermont Iron Ore District account for Canada’s total iron ore production, estimated at 47 million tonnes of iron ore concentrate per year (2013). Note: The port of Sept-Îles provides access to European and Asian markets, with shipping distances of 5,000 km to Rotterdam and 22,000 km to Tianjin, China. The railway line connecting to the port of Sept-Îles offers expansion options. In October 2014, Champion announced that the Government of Quebec and Lac Otelnuk Mining Ltd. (a joint venture between Adriana Resources and Wisco International Resources Development & Investment Ltd.) formed a partnership with Champion to advance the feasibility of a multiuser rail line to the Labrador Trough. The partnership is called the “Société ferroviaire du Nord québécois” (SFNQ). All mining companies in the region are invited to become partners of the SFNQ. The SFNQ was formed after the Government of Quebec tabled its 2014-2015 budget. The Government of Quebec granted a maximum of C$20 million from its Plan Nord fund to contribute to the study. Among many significant social and economic benefits, the new rail infrastructure will improve the Quebec-based mining industry’s ability to serve world markets with competitive long-term freight costs. Champion has been a strong and long-standing advocate of a feasibility study for a multiuser railway. It continues to support the government and the industry in Quebec through its participation as an industry partner of the SFNQ. The Bellechasse property is approximately 6 km northwest of our Consolidated Fire Lake North (CFLN) project. It comprises a 10-kilometre long curvilinear synform whose core consists of a magnetite-rich iron formation. The synformal geometry of the deposit is advantageous for open-pit mining methods, as the strip ratio is low. In 2009, P&E Mining Consultants Inc. of Brampton, Ontario published an inferred estimate of 215 million tonnes, grading at 29% total iron. This is double the historical estimate, which was based on the results of diamond drilling along 8 km of the 10-km length of the property’s iron formation. Champion Iron anticipates that the additional drilling planned will increase the estimate of the current volume of the resource. At a later date, Champion will assess the economic aspects and potential synergies of including the Bellechasse project in the CFLN development plan. 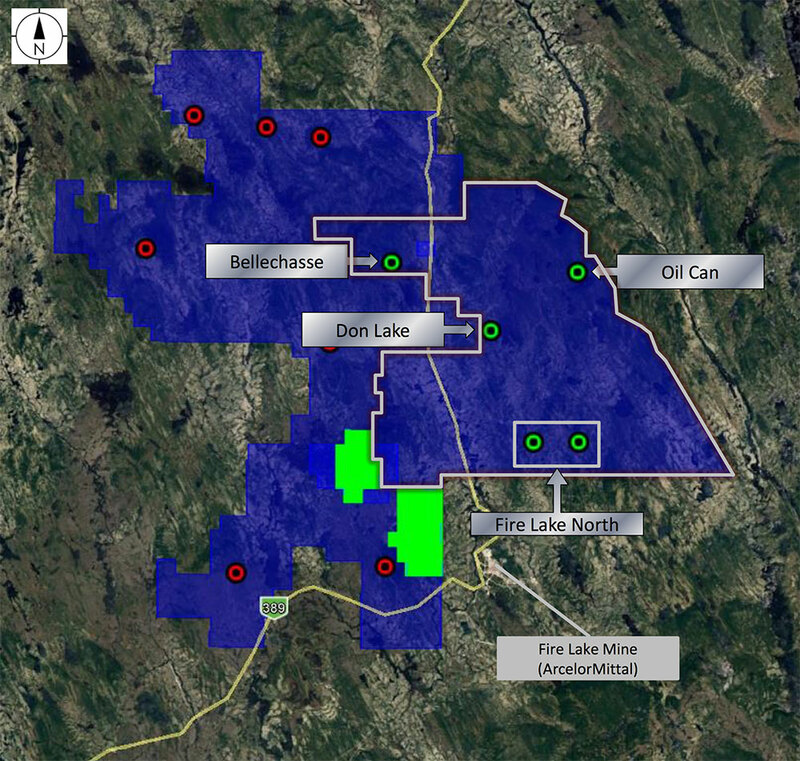 The Oil Can property is located approximately 60 km southwest of the town of Fermont, in Quebec. The project includes 81 mining claims and covers a surface area of 3,781 hectares (37.8 km2). There is road access from the Fire Lake North project toward the south. The Trans-Quebec-Labrador Highway (Route 389) lies 9 km west of the project. Aerial geophysical surveys conducted by Champion Iron in 2008 and 2011 show a combined longitudinal expanse of approximately 6 km of second vertical derivative magnetic response anomaly that coincides with local outcrops of the Sokoman iron formation, which is rich in magnetite and hematite. The region’s deformation history, as well as the spatial distribution and apparent shifting of geophysical anomalies, indicate that the iron formation contains synform cores, resulting from repeated thrusts that were subsequently refolded. The 2011 Oil Can project exploration program included 19 diamond-drill holes (OC11-01 to OC11-10) targeting magnetic anomalies approximately 400 metres apart. All the drill holes intercepted substantial intervals of iron formation, and preliminary results show that the formation is primarily magnetite and hematite.